This week's theme comes from Lathy, whose "Disco Romulo" was the winner of our Planned A Hand competition! 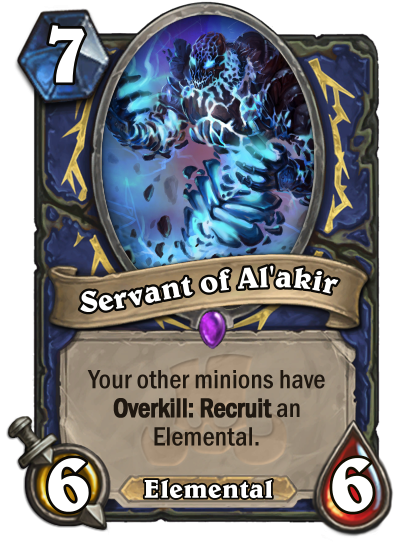 You must make a card that utilizes or interacts with Overkill, the new Keyword from Rastakhan's Rumble! Keep in mind that we do not yet know for certain all of the little details about Overkill; it seems like a simple Keyword, but we are jumping the gun here. Upcoming examples include: Baited Arrow, Sul'thraze, and more! Pay no mind to the text in red! I'm working on acquiring a banner. Wow. What a surprise theme. Just. Wow. Overkill is such a strange keyword. 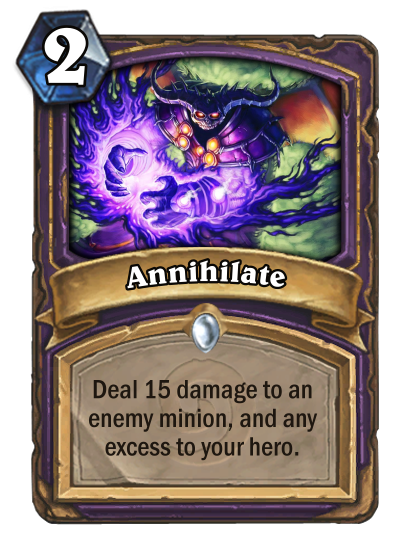 There are a handful of times where adding Overkill to a card actually makes the text longer. I made this cards before the theme was even announced :_D I don't think any of them is good enough, though. Well, I guess everyone expected this one. Thoughts? Very nice. 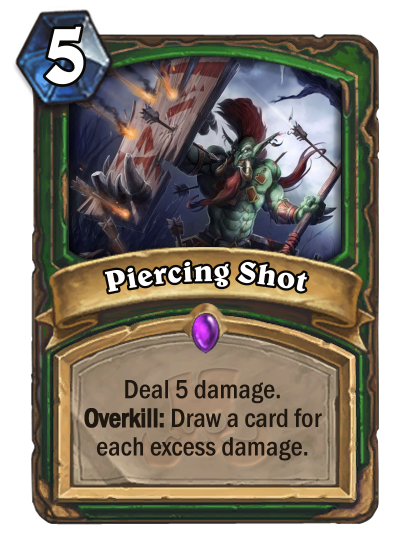 I'd drop the damage to 4 though, as drawing is extremely powerful in Hunter. 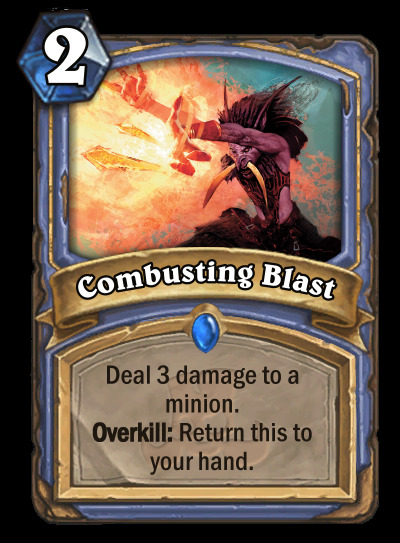 Combusting Blast could be problematic with Sorcerer's Apprentice. 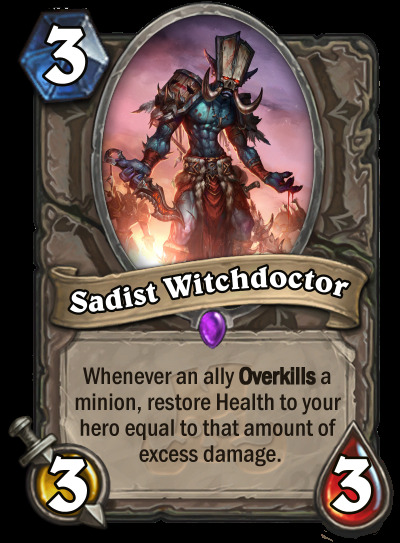 "Ally" is not a word in Hearthstone, although I don't know if there's any other way to phrase Sadist Witchdoctor so it works for your minions and hero. Searing Felfire however is fantastic! 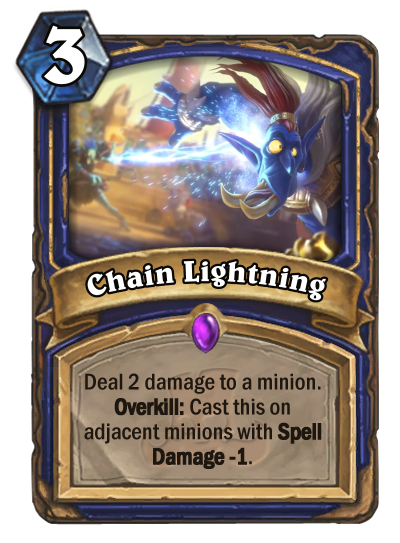 I like Chain Lightning, though it's a bit complicated. 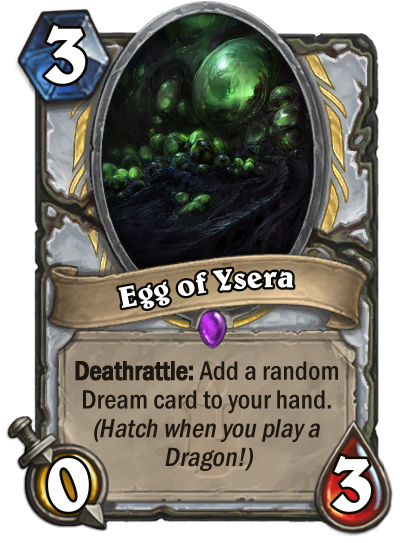 I'd rather it was plain deal damage, but I guess that's just a board clear. You could try making it "Deal 2 damage to a minion. 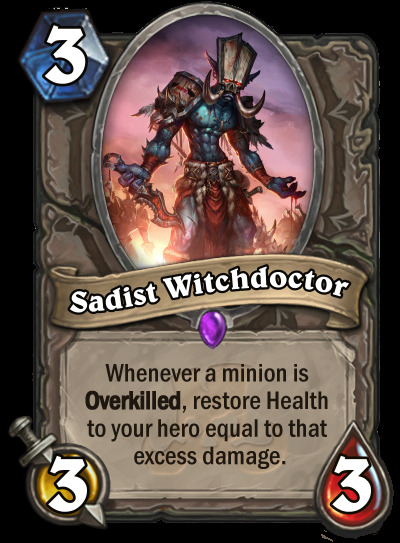 Overkill: Cast this on the minion on the left". That's a bit more under control. I'd also reconsider the art, they always look better than trailer art. Parasite's a second pick. 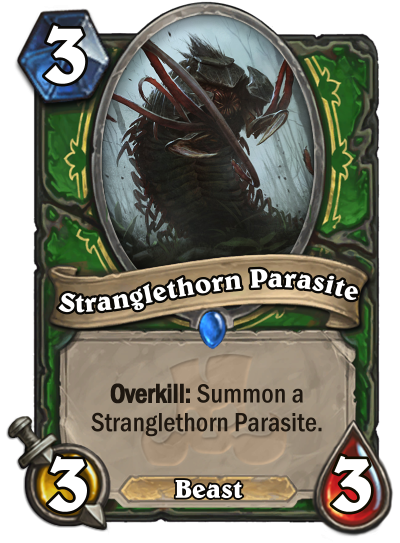 It's a very nice Hunter minion, though not as interesting as Chain L.
Hey guys, been along time since I took part in one of these, but I'm itching to make some cards. This is a tough theme! 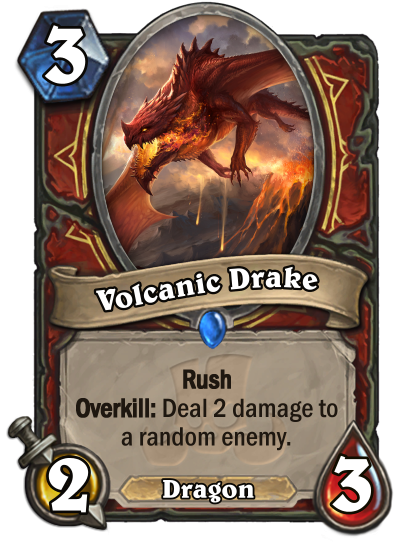 We've only seen a single overkill card, I think. Also, I think it's important to tie our cards to Trolls and Gladiator/Wrestling stuff. Also, all the classes have very specific identities tied specific animals. Some of those animals are kind of exotic, like lynxes for Hunter. 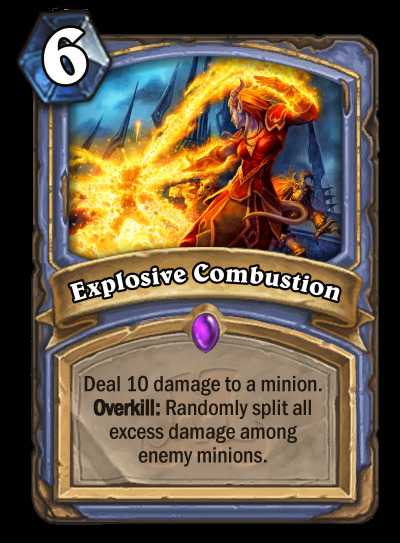 I mean, I guess we could just make Overkill cards with any theme, but that seems lame. 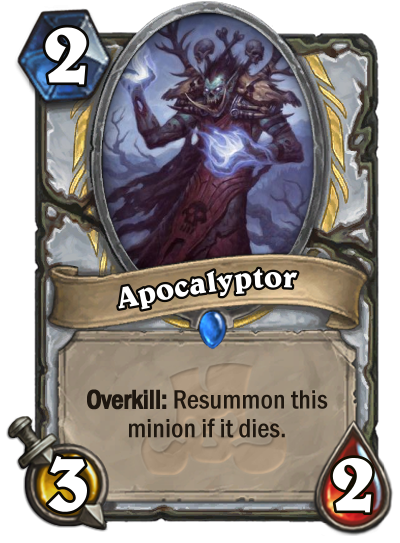 Have seen the final text on the Overkill keyword? I understand it only triggers on the players turn, not your enemies turn. 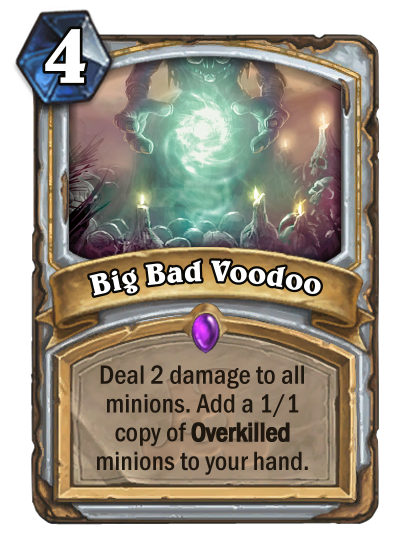 I hoped people would wait until we have more overkill cards revealed, but this topic was inevitable. Boardclears now hit face. No ponger shpuld you feel bad for fireballing something with 2 hp. Even though I love Searing Hellfire there's a problem I'm not sure it's big or not. Oh, was not aware of it. 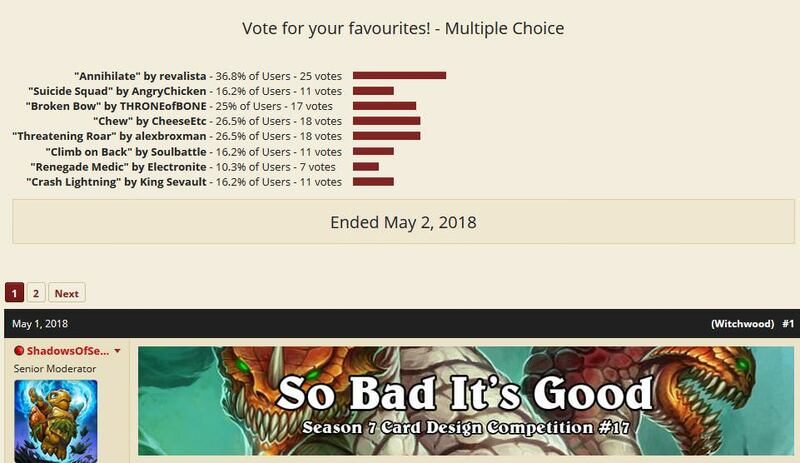 Thanks for pointing it out, I'll use some other card! 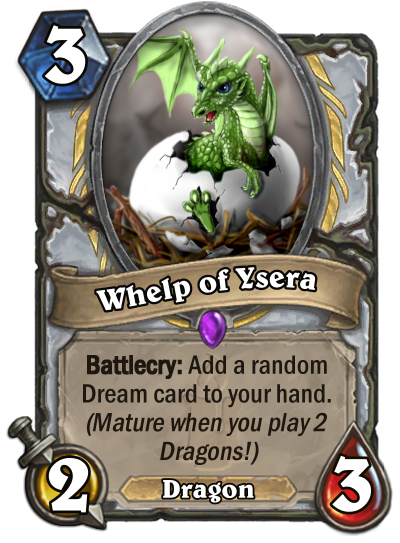 Ideally it's supposed to create the Druid-equivalent of Kingsbane decks, where you use cards like Claw, Bite, and Savage Combatant to turn the hero itself into a deadly force. 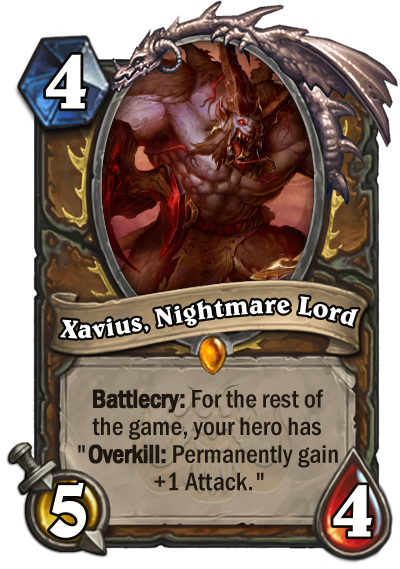 The more times you Overkill minions, the stronger you become as the Nightmare takes hold of you and drives you crazy. 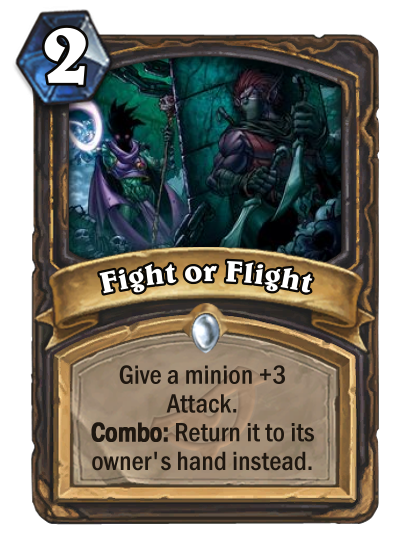 Could be an Odd or Even deck as well - depending on how I cost the minion - for the empowered Hero Power. It should remind you of The Scarecrow fight from Monster Hunt, with his Scythe weapon. A slow growth into a terrifying juggernaut, but the Druid has to use his face to do so and he can really only go up one point at a time. 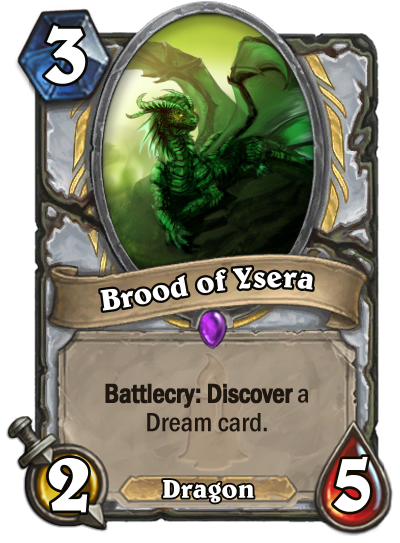 Ideally it's supposed to create the Druid-equivalent of Kingsbane decks, where you use cards like Claw, Bite, and Savage Combatant to turn the hero itself into a deadly force. The more times you Overkill minions, the stronger you become as the Nightmare takes hold of you. 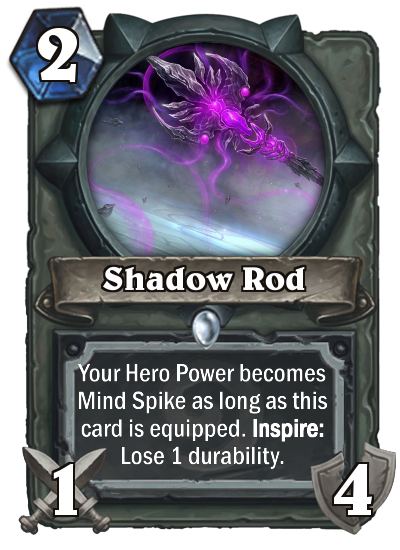 Could be an Odd or Even deck as well - depending on how I cost the minion - for the empowered Hero Power. 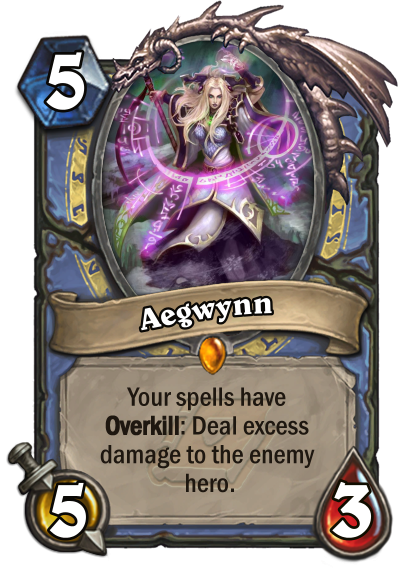 When you say your hero has Overkill, it sound as if it aplies to your spells. That's a bit too powerful. Maybe if it read "Battlecry: When your hero Attacks and kills a minion, it gains +1 Attack for the rest of the game." it would be better? idk. The card itself is poewrful regardless what the text reads. I don't know how to feel about it. It's snowbally, but restricted to hand-to-hand combat. 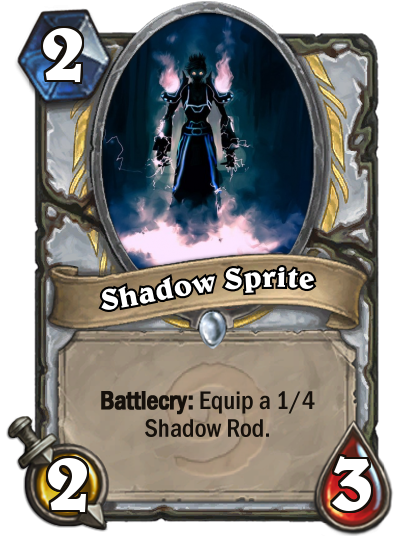 However, it does gain a lot of power from the DK and the amount of Armor Druid can acquire. 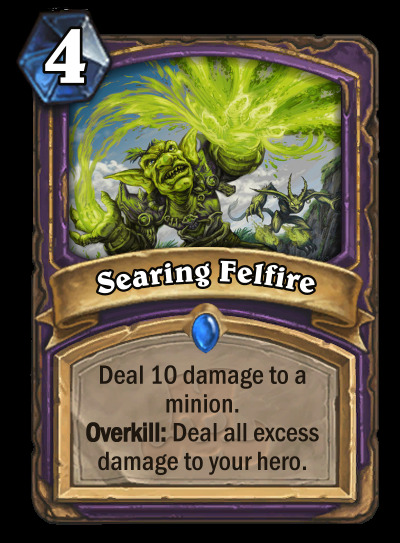 As for your cards, I agree in-that Searing Felfire does have the overlap with a previously-winning card. To eliminate any issues regarding the use of the word "ally" in Sadist Witchdoctor, you could always use "adjacent" instead, like Flametongue Totem. That also helps add some decision-making to your plays, requiring proper placement. With that change, I would like the Witchdoctor the most: it's a neat play on the good ol' Voodoo Doctor. 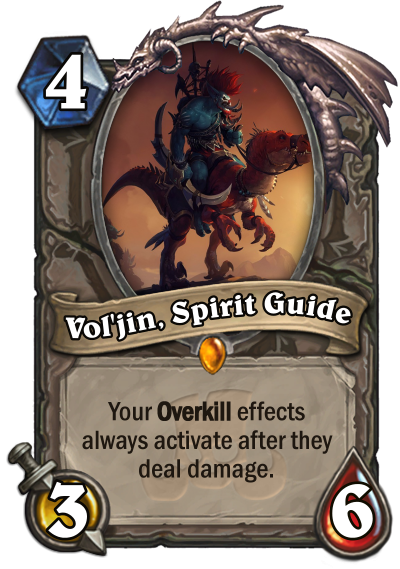 I don't really get Vol'Jin. Don't all Overkill effects trigger after they deal damage? 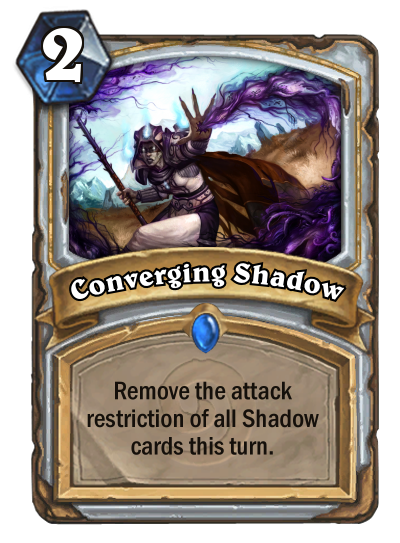 If by that you mean "Whenever a friendly minion damages a minion, trigger it's Overkill effect" and such, I can't really see it in that text. It's confusing, to me at least. 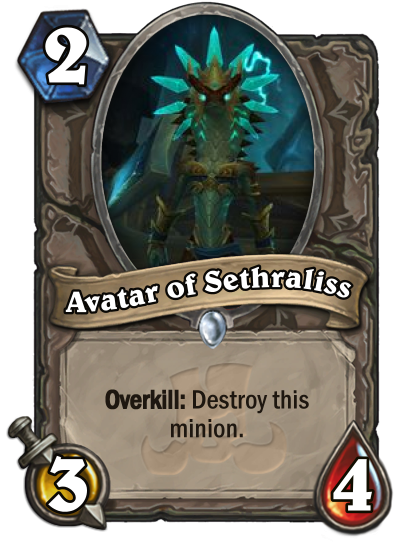 Avatar of Sethraliss is a bit better, though not really interesting imo. You could make it a warlock Demon, it fits the flavour of the class. Still, I don't find the design particularely interesting.